Our mission is to teach individual investors to use options conservatively and intelligently - adding safety and profitability to their portfolios. But before trading options, it's best to understand exactly what an option is how an option works. You can read my personal trading philosophy, which includes advice for option rookies. Thus, the natural place to begin is with the basic concepts of options. The options world has its own language, and if uou are unsure of the meaning of new words you encounter, use the glossary. We periodically write a short article or column on various option topics. See the current column or visit the column archive. There's also a discussion of volatility and how the theorectical value of an option is calculated. If you are going to trade options, you must understand how option prices are determined in the marketplace. You can learn about the VIX (CBOE Volatility Index), with VIX graphs, updated weekly. There is also a good discussion of iron condors and how to trade them. Begin here and follow the links. 1. CBOE. The Chicago Board Options exchange offers excellent guidance for beginners at its learning center. 2. OIC. The Options Industry Council: OIC offers a variey of material for investors who are learning about options. 3. The Options Clearing Corporation OCC has information for those who are interested in details of how the options industry works. We've written three books especially for investors who are first learning about options. 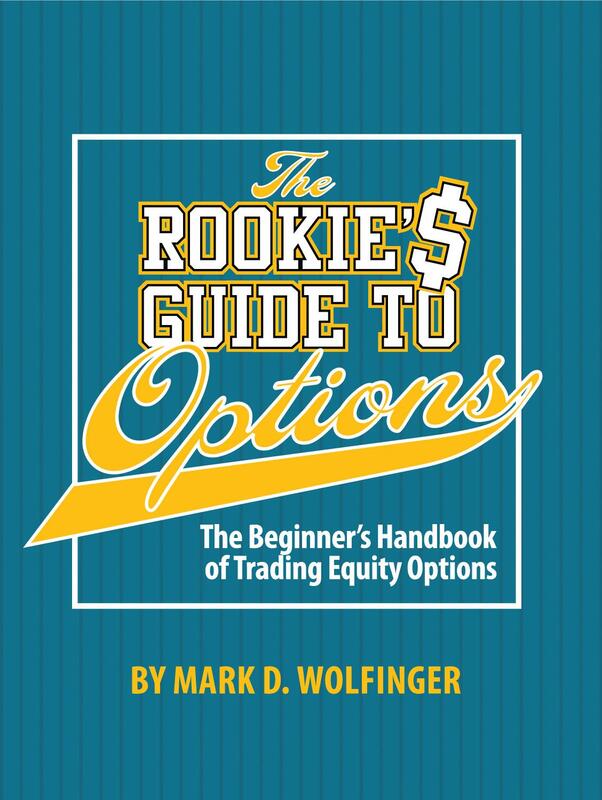 The Rookie's Guide to Options Options: The Beginner's Handbook of Trading Equity Options explains, in detail, all you need to know to begin trading options successfully. You want an investment portfolio that is both safer and more profitable. Even the experienced options trader will find useful information on this web site, but the investor who will gain the most from mdwoptions.com is someone who is relatively new to options. The buy and hold investor has to depend on selecting stocks that increase in price in order to earn money from his investments. By adopting conservative option strategies, you can earn a profit, even when your stocks decline. By adopting any of the strategies taught in The Rookie's Guide to Options you will enjoy a greater number of profitable positions, but in order to gain the benefits described, the investor has to give up something. That something is the opportunity to make a bonanza on any given stock. We believe that the investor who makes steady profits - repeatedly - will be better off over the long term than the investor who stubbornly searches for that elusive jackpot. Is this site only for the beginning options trader? No. These pages include discussions of more advanced topics, giving you a better understanding of how options are traded. Both volatility and the calculation of theoretical option values are such topics. And the book contains matereial suited to the seasoned investor. Download a descriptive e-version. Have questions? Want clarification? Please ask via email. We offer one on one consultation and seminars covering a variety of option topics. Visit the site map to tour this site. Welcome to the options universe.